Disorder is the enemy of modern design, so we've put together 10 of our favorite kitchen storage solutions to help keep your counters clean and clutter-free. High 'n Dry Cargo NetDeveloped in Rhode Island by a rope expert, the cargo net is sturdy yet lightweight and ideal for use in a kitchen to free up counter space. Latina Coffee JarThis curvy storage jar designed by Angeletti Ruzza and coffee producer Lavazza in a glossy red acrylic, is dishwasher safe, provides airtight storage for coffee and tea, and adds a bit of punch to your counter top style. Practical and elegant kitchen storage for everything from rice to sugar to jam. Airtight stoppes and lead free glass are perfect for foods, and come in 5 sizes. 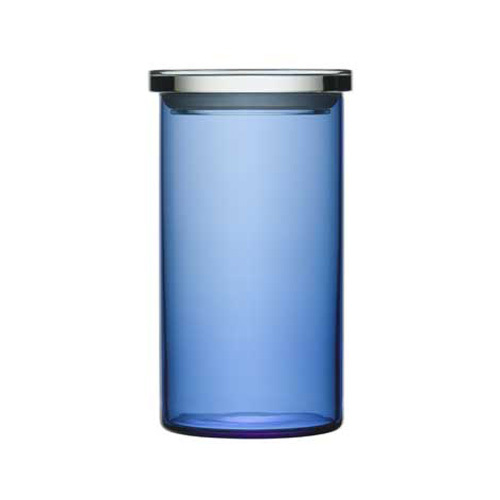 Easy access kitchen countertop canister collection from Simple Human. An ergonomic handle and fun push button release make for a good interaction with your food storage. They even have a five year warranty and customizable labels. This modular counter top wine storage unit is made of walnut veneer and, like a beehive, can pack a multitude of storage nooks into a small space. Cammeo Jar The Cammeo jar by Louise Campbell is a clean and simple jar design with a twist. Interchangeable colorful bands remind you which has what inside of it and add just a touch of whimsy. Available in three sizes. Better suited to storing sugar than supporting Apollo missions, these ceramic kitchen storage containers’ lines were nevertheless inspired by space capsules. Armstrong and Aldrin would definitely approve. Finally, kitchen storage jars for the numerically inclined. These earthenware containers come numbered zero to nine, each with a cork top to keep your spices fresh and countertops in order.